What evil could possibly be hidden in a recently-recovered painting done by an obscure artist, whose major claim to fame, besides the work of art, was that he was friends with the likes of poet Lord Byron and Mary Shelley, the author of Frankenstein? Lovers and occasional colleagues Danni Cafferty and Michael Quinn must answer this question when a series of heinous murders follows the sale, and delivery, of Ghosts in the Mind to a wealthy widow in New Orleans. Quinn, called to the scene by his former partner on NOLA’s police force, Larue, investigates the murders, while Danni examines a copy of the painting at a local gallery. Neither wants to believe that the infamous artwork is haunted, but both history and recent events tell tales of death following the painting in its wake. As the death toll rises, Danni and Quinn lead an unusual team to the source-the location where Henry Sebastian Hubert painted the original work, Lake Geneva, Switzerland, in an effort to exorcise the evil manifesting on the streets. The society widow, a coroner, a parish priest, a voodoo priestess, and couple of Danni’s employees join together in a quest into the heart of darkness, and a crypt that has been untouched for 200 years. This particular novel, the second in the Cafferty and Quinn series, has a wide-ranging plot that includes eleven possible killers that are no longer among the living, as well as several suspects, and a couple of not-suspected individuals, who may or may not have committed some of the murders. My only issue with the plot was the first scene on the castle grounds, which was a very close match to Natasha’s (the voodoo priestess) earlier ominous vision of what Danni might face. The problem I saw was that none of the characters acknowledged or appeared to recognize the similarities to the vision, which turned out to be disappointingly very anti-climactic, because its resolution did not stop the “evil.” However, the finale to the plot was very satisfying; as Danni discovers the identity of a villain that in life was a virtual puppet master who lured people into carrying out horrible deeds, a legacy he continued after his death, and a heartbreaking betrayal leads to the identity of the living murderer. 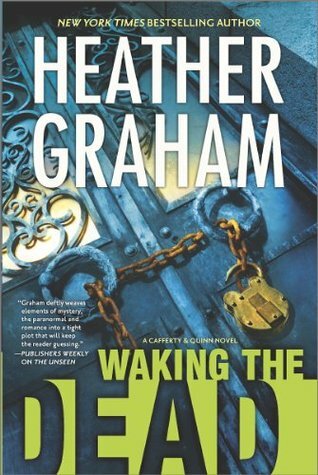 Overall, I give this book 4 stars and recommend it to any fans of paranormal romantic mysteries, as well as fans of Heather Graham’s other series. Or perhaps NOT right before bed, Christy! LOL.